There's nothing like a warm, buttery croissant on a chilly fall morning... especially one that's loaded with flavorful roasted turkey, crisp smokey bacon, sunny-side up egg, and delicious blueberry-covered goat cheese crumbles. The blueberry-coated goat cheese—available at Trader Joe's—may seem like a weird addition to this breakfast sandwich, but its sweet, yet tart flavor is perfect against the richness of the meat and croissant early in the morning. Not into unique fromage? 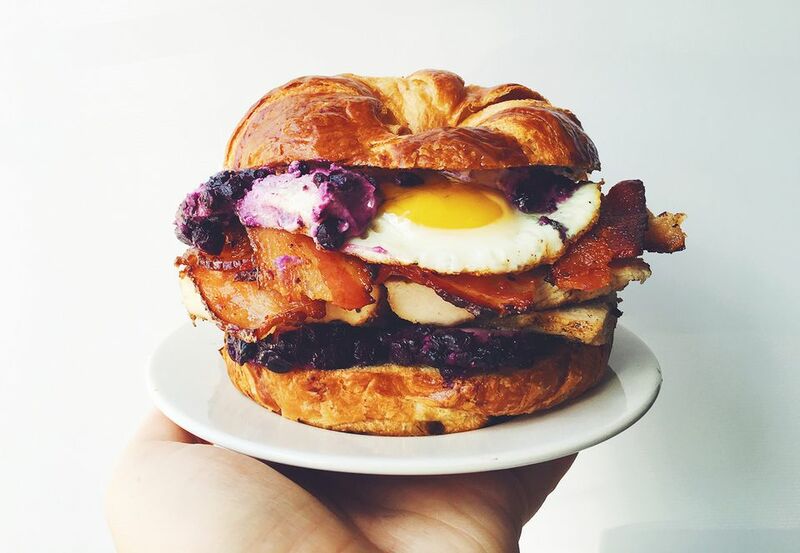 Don't worry, there are more breakfast-friendly options that would also be delicious on this sandwich. Try pairing a little bit of applewood-smoked cheddar with apple butter or a couple slices of buttery muenster cheese with raspberry jam. Slice the croissant in half and heat in the oven. Take a small non-stick frying pan and melt the pat of salted butter. Add the egg and cook, sunny-side up, over medium-low heat until the white is cooked through and the yolk is still runny. Sprinkle with a little bit of salt, remove from heat and set aside. Take the croissant out of the oven and crumble half of the blueberry goat cheese onto the bottom half. Add the turkey slices, bacon, fried egg, and the rest of the blueberry goat cheese. Top with the remaining half of the croissant.